Hey, my name’s Jason Yang and I’m a new intern here at Powered by Search. I started this September and I’m still quite the beginner at online marketing. One of the things I’ve been trying to focus on lately is learning Paid Search Marketing. And while reading whitepapers and articles have been great to give me an introduction to the basic concepts, I’ve often found myself longing for something more practical. I’m a big believer in experience being the best teacher, and that’s why I decided to learn PPC in a more unorthodox way. And the way I’m choosing to learn is through playing this game, called Simbound. What is Simbound? Well, it’s a simulation game based on online marketing. You play the game as a company trying to sell tablets online to the US and UK markets. The catch is, you can only do it through the game’s virtual search engine by creating and launching ad campaigns. Basically it’s a simplified simulation of running a Google Adwords campaign. It includes everything from researching your keywords, to writing your ad copies, to creating your landing pages. Sound interesting? That’s what I thought too. Here’s my experience so far on the game, and what I’ve been learned through playing it. The game begins with me being going through a Simbound tutorial and walkthrough on using the platform and features of the game. 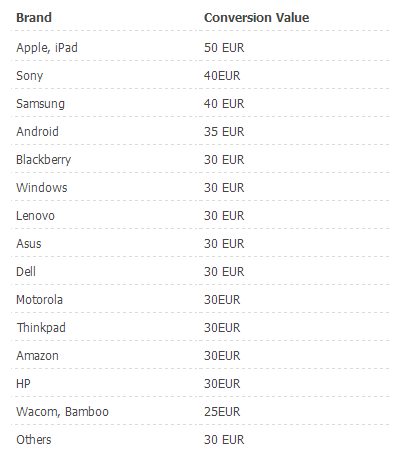 Next, I’m given a list of what brand of tablets I’m going to be selling online for. I figured I’d start with a very broad approach to brand targeting. While the top tablets from Apple, Sony and Samsung seem like juicy targets to solely focus on, I simply wasn’t sure of that. What if Ipads were hotly contested and advertising costs ended up outweighing the extra value gained from them? What if Bamboo tablets were the next big thing and were going to be the most profitable tablet to sell? I thought that for the beginning it’d be wiser to target all the brands, and after I get back the results by the end of week, I’ll be able to use that feedback to figure out exactly which brand are the most profitable and optimize my campaign for them. As I navigate towards my campaign manager, I’m given the list of keywords I can potentially target in my ad campaigns. Simbound here has simplified the process a bit by already compiling all the possible keyword combinations in the simulation that I could target. So, there’s no need for me to find out new keywords. Instead, I’ll be focusing exclusively on researching which ones will be the most profitable and weeding out the least profitable ones. My initial thoughts are to immediately eliminate the less relevant keywords. This is pretty much picking off the low hanging fruit. 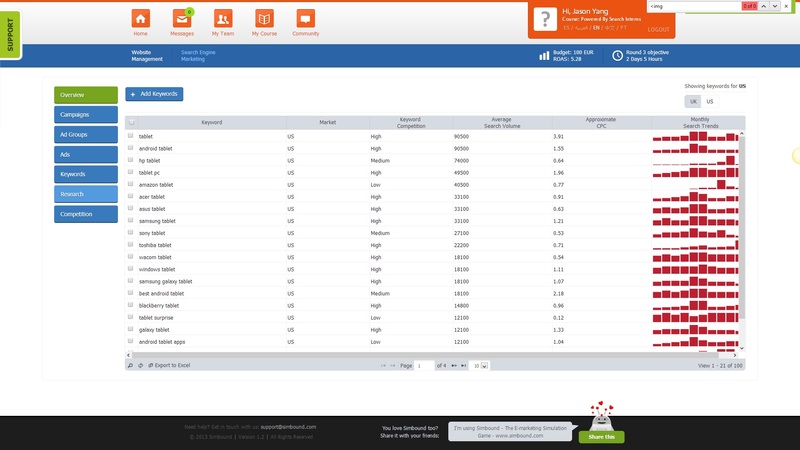 Coming from basic intuition, I’d expect keyword phrases such as “android tablet review” or “android tablet vs ipad” to be the least effective at conversion, simply because of the nature of the search query. Next, the keywords left seemed pretty divided between either being a broad search term with large search volume (Android Tablet), or a very specific term with low search volume (Asus EEE tablet). While I had a hunch that the specific low volume keywords should convert better, I wasn’t sure again. And so, like what I did with the brand targeting, I chose to evenly spread out my focus between the two groups until I got better feedback. After the keyword research was done, it was just a matter of writing a basic ad copy and also setting up a “landing page” for my products. I had an initial budget of $1500. I chose to evenly divide them between all the different tablet brands. Each brand would get a budget of roughly $150 for their ads. $100 would go to the US campaigns, while $50 would be used for the UK campaigns (UK offered fewer incentives with decreased sale margins because of “shipping costs” and less search volume). I also chose to set the bidding price to the recommended setting. Again, while this probably wasn’t the best practice, I wanted feedback first from results before deciding upon my bidding strategy. Well, to be honest I wasn’t expecting much since it was my first time as a beginner. I felt like I made a lot of progress this week in terms of understanding the fundamentals of PPC. While my results show that I’m still not at the levels of my other two colleagues, I’m confident that I’ll give them a run for the money during the later rounds. Looking back over week one, I think I can pinpoint two key lessons that I learned while playing the game. Why just stick to your own strategies when you can “borrow” from others. While I still trusted my own intuitions, I would always compare my campaign against my competition. By keeping tabs on them, I get to see what things they’re doing that’s making them successful and maybe copy those elements myself. As an example, I would always search for my competitor’s ad copy. First of all, it helped me write my own ad copy. Second of all, I got to see what specific keywords and markets they were trying to target. Sometimes those were great tips and a lot of my successful ads came from this strategy. I saw that Troy was having a lot of success from android tablets, especially in the UK market. I decided to create a rival ad while also bidding higher to get the number one spot. It turned out to be one of my most profitable ads. You can stick to safe choices, but you’ll end up missing profitable opportunities.You should never let the fear of risk cloud your judgement. Always make the decision with the best expected value and follow through. In my case, it was investing into my Lenovo tablet campaign. It was a small brand that had a smaller profit margin compared to Apple or Android. However, I noticed that conversion rates were quite high and no one else was going after them. I decided to invest some of my budget into it, and it paid off big. Lenovo outperformed every single one of my ads. I hope you enjoyed reading about my progress through week one on Simbound. While it’s only a simulation game, it’s provided me with a great learning experience. 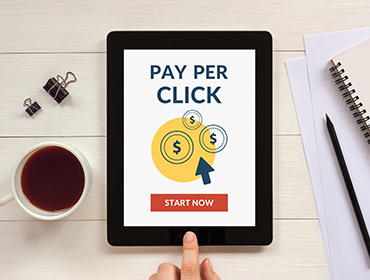 I’m still a beginner at PPC, but I hope to take these lessons and apply them into real PPC campaigns. If you’re interested in learning more about Simbound, check out their website here! Do you think a simulation game can help with PPC? What are some other strategies I could use to help me in Simbound? Tell me what you think in the comments below! Get your Free 25 minute Marketing Assessment with us.